Stefani Joanne Angelina Germanotta, a little girl with a big name, crossed her arms and glared at the camera. She had no use for piano lessons and didn't care for them at all. Stefani did, however, have "a strong desire to perform." When she was eleven she attended a prestigious, private Catholic school where she met a wide variety of girls. Her memories differed somewhat from that of her peers. Stefani "felt like a freak" and claimed she was "artsy and unable to fit in with the crowd." They claimed she was actually popular. She was passionate about acting and by the time she was fifteen those piano lesson came in handy as she performed in open-mike clubs. Her performances and goals, fully supported by her parents, were an inkling of what was to come. Stefani's nonconformist attitude left her with little patience for school or college, but rather fueled her desire to perform. Her first band, named after her, made little headway as it was a bit too "singer-songwritery" normal according to a friend. Stefani had much more to her than the norm, it was just a matter of finding it. She was trying to be a rocker, but "it was a style that didn't suit her vocal abilities or personality very well." Things would soon change for that girl who disliked those piano lessons...dramatically. When Stefani was nineteen her father decided that he would pay her rent for one year while she waited to "be discovered." What she discovered instead was the world of drink and drugs. That was not a part of the bargain and angered her parents, especially her father who told her, "You're [screwing] up kid." The behavior stopped and her search for discovery began anew. In this book you'll read about how she was discovered, her fashion makeover, her personal life, musicians who influenced her, how she paid her dues, how she developed her "unique style," her setbacks, her songwriting, her tours, her arrival, her albums, her political activism, and you'll learn much more about the amazing career of the "fame monster," the fabulous Lady Gaga. 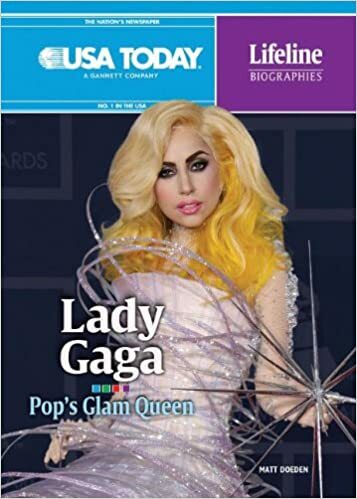 Young and old readers alike will enjoy reading about Stefani and the way she was instrumental in marketing herself. The author's positive portrayal and conversational writing style made this biography quite enjoyable. The "freak" becomes a glam queen, one that is intelligent, talented, and quite likeable. Interspersed in the pages are actual period USA Today articles and numerous informative sidebars that add much to the biography. For example, one of them talks about how Stefani lost a friendship because of greed and a threatened lawsuit. The book is generously illustrated with photographs. In the back of the book is an index, a timeline (1986 to 2011), a discography, source notes, a selected bibliography, and additional recommended book and website resources to explore. Quill says: This is an amazing portrait of Lady Gaga, the woman who made a meteoritic rise to the top of the charts.